One evening this week, I came home after some post-work socializing to an empty apartment. This was to be expected, since the david was in Vegas for a work conference. I stared at it. And in retrospect, I wish I could have videotaped myself staring at this mess in the moments in between discovering it and realizing that I should look up. 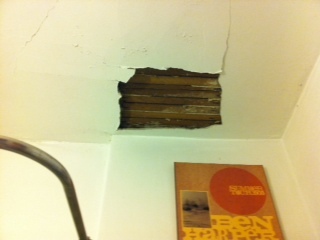 Where a large chunk of ceiling was missing. I did not snap a picture of the mess. I went into autobot mode and started sweeping it up immediately. Also, I really had to pee and the potty was buried in an archaeological dig.